On June 28, 2010, Voyager 2 completed 12,000 days of continuous operations since its launch on August 20, 1977. 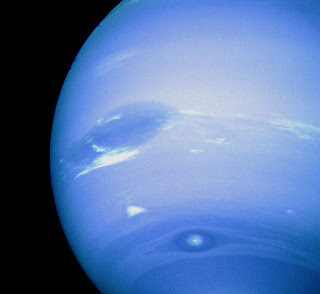 In the summer of 1989, Voyager 2 became the first spacecraft to observe the planet Neptune, its final planetary target. Passing about 3,000 mile above Neptune's north pole, Voyager 2 made its closest approach to any planet since leaving Earth 12 years agao. Five hours later, Voyager 2 passed about 25,000 miles from Neptune's largest moon, Triton, the last solid body the spacecraft will have an opportunity to study. planets and the interaction of the solar wind with interstellar winds in the heliosheath. Having traveled more than 21 billion kilometers on its winding path through the planets toward interstellar space, the spacecraft is now nearly 14 billion kilometers from the sun. Traveling at the speed of light, a signal from the ground takes about 12.8 hours to reach the spacecraft. Patti Wamsley has been a Cosmosphere volunteer for thirty years. Wow! Isn't that incredible? We're so thankful for her long term service. 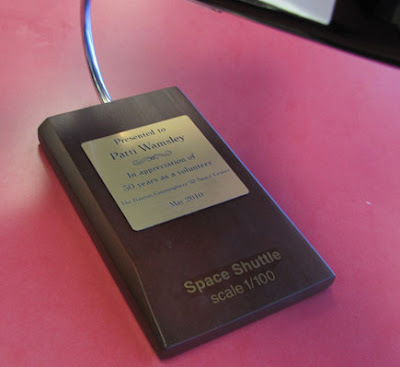 Patty Carey, who started the planetarium that grew into the Cosmosphere, recruited her. 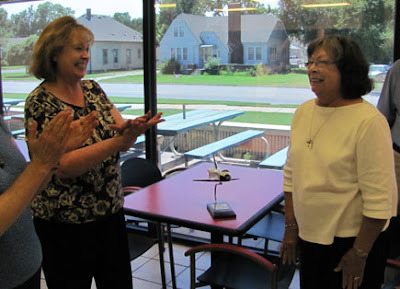 Over the years Patti has helped with a wide variety of tasks. 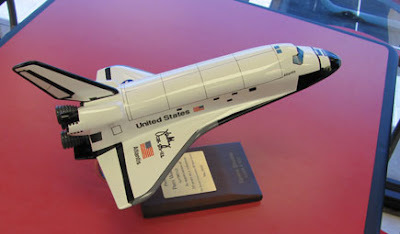 She was presented with a space shuttle model, autographed by Astronaut Jeff Ashby, who flew this particular shuttle. “Legends of Flight” opens at the Cosmosphere’s Carey IMAX® Dome Theater on Monday, June 21. 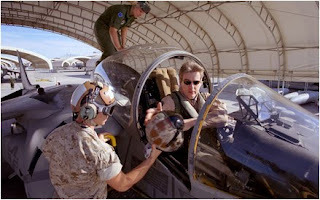 Fly with the Boeing Company’s chief test pilot Captain Mike Carriker, a Kansas native, as he soars through the Rocky Mountains, executes a vertical takeoff in a Harrier Jump Jet, and maneuvers an antique wooden bi-plane. 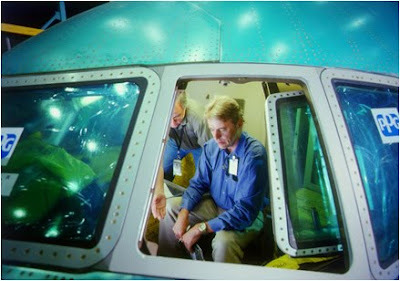 Flying sequences are capped off as viewers are alongside Carriker on the 787 Dreamliner’s maiden flight. Carriker is a legendary contemporary pilot, flight rated in more than 100 airplanes. He graduated from Wichita State University in 1978. “Legends of Flight” explores the relationships between natural flight, advanced design, assembly techniques and technologies that have ushered in a new era of aircraft design. In the hundred-year-plus history of aviation, truly radical new aircraft designs come along only once in a generation. Since the introduction of the wide bodies of the late 1960s and early 1970s (followed by the Boeing 777 in 1994), there have been no truly "game changing" new passenger airliner designs until now, with the development of the Airbus A380 and the Boeing 787 Dreamliner. See how a century of aviation trial and error, and some of the seminal airplanes of the 20th century, influenced the design of the Dreamliner. Viewers will see the first public flight of the massive, but super efficient Airbus A380 at the 2007 Paris Air Show and the first flight of the smaller, even more efficient 787, the first-ever carbon fiber airliner that made its maiden flight in 2009. “Legends of Flight” will also give audiences an insider's view of how a modern aircraft is built, and make them privy to the manufacturing challenges and incredible financial risks companies assume when they embark on radical new designs. In the end, this unique cinematic experience shows how the 787 might affect the next 100 years of aeronautical design. Produced and directed by Stephen Low, in association with the Smithsonian National Air and Space Museum, the film will engage all who have an interest in flight, regardless of age or gender. The Cosmosphere is honoring Dads with a buy one, get one free pass on Father's Day, Sunday, June 20. Bring dad to see a movie in the Carey IMAX® Dome Theater, a planetarium show, Dr. Goddard's lab and the Hall of Space museum. Dad gets in free with a paid admission. 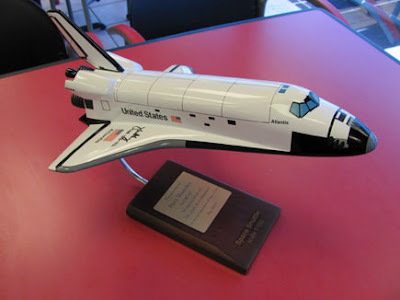 The Cosmosphere has the most comprehensive collection of American and Russian space artifacts in the world, and is the only Smithsonian affiliated museum in Kansas. About 150,000 people visit from all over the world each year. Currently showing in the Carey IMAX® Dome Theater are the movies Hubble and Vikings. Hubble has footage from three different shuttle missions and takes you into space like only an IMAX® movie can do. Vikings captures the history of these magnificent ship builders. The Justice Planetarium Theatre is offering a new show, "Beneath a Kansas Sky," created by Cosmosphere staff. Dr. Goddard's lab is a perennial favorite with all ages. It is a live show that details the history of rocketry and includes controlled explosions, guaranteed to excite. Take time to enjoy the Cosmosphere with the family this Father's Day. Dads get in free with any paid admission to any or all venues at the Cosmosphere on Sunday.